Field Guide to Sewing Machines: a pictorial guide to help you identify machine types, brands, models and accessories. How to Pick a Proper Pattern: Taking body measurements, normal ease in patterns, size and type of pattern, individual measurement chart, information on pattern envelope. Metric system of measurement. WHICH KIND OF SEWING MACHINE IS FOR YOU? A commonsense guide to the workings of your machine: how threads and yarns are handled and what types are likely to cause trouble; how the machine forms its stitch; how its parts work together smoothly. Sound guidelines are given for buying the right sewing machine, serger, or knitting machine for your purposes; then, armed with the right tools and a basic understanding of why and how the machine does its job, you’ll find that glitches occur infrequently, and are easily isolated and fixed when they do. We are licensed to sell and repair every brand of machine. Our unusual perspective of analyzing operator technique in combination with machine function led us to a long teaching career, traveling widely to give seminars and workshops. We own and operate several sewing machine shops in Southern California. International Sewing Machine Collectors' Society -- Whether you have three machines or three hundred, or simply an urge to know more about those wonderful old sewing machines and the men who made, and more often lost, fortunes bringing them to reality, you will find fascinating reading on this site. How to Use Your Sewing Machine Attachments -- Many attachments come with modern sewing machine. Usually, they are laying in the accessory box for years. All these attachments can save you a precious time when using them properly. How to Overhaul a Sewing Machine Motor in 30 minutes -- most sewing machines use "universal" motors. They can be overhauled in less than an hour by following a a few simple steps. Carbon accumulation and brushes sparkling are the main causes of motors performing poorly. All you need is some sandpaper, machine oil and an electric drill. PatternReview.com -- online forum used by tens of thousands of sewers to collaborate, share and discuss the projects they have been working on, or are planning to work on. It catalogs and describes sewers experiences and opinions in a structured way so that you can quickly and easily find the information they are looking for. The value of this site keeps increasing as more and more sewers start using it. SewForum.com -- information and advice about embroidery, sewing, serging, knitting and quilting. Also includes industrial sewing topics. Sewing Machine Scam! For those who have seen flyers in the mail that say something like: TRUCK LOAD SALE! 2006 Singer Commercial Grade/School Model America's Sewing Machine Co. Placed large orders of the 2006 model school sewing machine. These machines remain UNSOLD! THEY MUST BE SOLD! Wikipedia's Sewing Glossary -- including: Backstitch, Chain stitch, Darning mushroom, Seam ripper, and more. 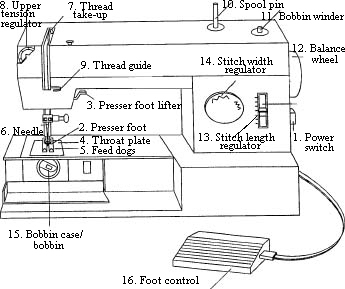 Wikiversity--Sewing: articles about basic skills in the field of sewing. Start Your Own Sewing Business In 5 Easy Steps -- If you have any sewing experience from high school, after making some basic skirts, drapes, Halloween costumes or any sewing projects around the house, it might be time to put your skills and that sewing machine to good use -- and start making some extra money. SEWING LESSONS (blog) -- FREE SEWING LESSONS ADAPTED FROM THE 19-CENTURY "ENCYCLOPEDIA OF NEEDLEWORK", BY THERESE DE DILLMONT. People who knit, sew, quilt and embroider all concur: it's a challenging, yet fun and rewarding hobby. The quality and durability of homemade clothing simply can't be beat, regardless of cost. We are committed to helping you choose the best Sewing Machines, Embroidery Machines, Sergers, and Knitting and Quilting Supplies. Along with clothing equipment, we offer helpful tips and information to help you make informed purchasing choices. Our goal isn't to clutter your shopping experience with useless junk. From the beginner to the serious sewing, knitting and quilting enthusiast, we have a selection of products to suit a person's level, goal, and experience. We have partnered with some of the Internet's largest sewing machine and fabric vendors to to bring you the very best equipment and supplies, which is also affordably priced and backed by solid customer service. Please note: sewing machine quality isn't ubiquitous: the best brand of sewing machine at $200 isn't necessarily the best at $3000. That’s why we offer so many brands, to give you quality options no matter your budget.